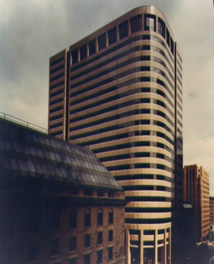 260 Franklin Street office building by the Principals of Miller & Favazzo Properties - quality real estate development and property management. This 350,000 SF, 21-story office building was designed by the Stubbins Associates. Clad with polished granite of two colors, the curved façade responds to the constraining corner urban site. When initially constructed, the building served as headquarters for Winthrop Resources Corporation, and now is home to several quality tenants.